Some of the employees at Apple’s manufacturing centres in China complain about working excessive overtime without a single day off during the week, living together in crowded dormitories and standing so long that their legs swell and they can hardly walk after a 24-hour shift. Almost 140 workers at a supplier in China were injured two years ago using a poisonous chemical to clean iPhone screens – and two explosions last year killed four people while injuring more than 75. Apple had allegedly been alerted to hazardous conditions inside the Chengdu plant in southwest China before the explosions at those plants, reported the New York Times. “If Apple was warned and didn’t act, that’s reprehensible,” Massachusetts Institute of Technology work safety expert Nicholas Ashford told the New York Times. “But what’s morally repugnant in one country is accepted business practices in another, and companies take advantage of that,” the former U.S. Labor Department advisor added. Banners in the Chengdu plant gave a warning to the 120,000 staff: “Work hard on the job today or work hard to find a job tomorrow.” Workers who arrived late often had to write confession letters. The newspaper’s report comes hot on the heels of Apple announcing whopping $13 billion profits on $46 billion sales in its last quarter – but the firm still wants its overseas factories to produce more. Apple executives claim it has improved factories in recent years and issues a supplier code of conduct on labour and safety – but problems still exist, according to employment advocacy groups. More than half of the suppliers audited by Apple have broken at least one part of its conduct code each year since 2007 and have even broken the law in some cases, according to company reports. A Foxconn employee jumped or fell from a block of flats after losing an iPhone prototype in 2009 – and 18 other workers apparently tried to commit suicide in two years, reported the New York Times. Suicide nets were installed to prevent workers from jumping to their deaths and Foxconn began providing better mental health treatment for its staff. Li Mingqi worked for Apple manufacturing partner Foxconn Technology until last spring and helped manage the Chengdu plant which had the explosion. He is now suing Foxconn over his dismissal. “Apple never cared about anything other than increasing product quality and decreasing production cost,” Li Mingqi told the New York Times. The fatal Chengdu explosion came from an aluminium dust build up three weeks after the iPad came out. Despite Apple’s probe, seven months on there was a further, non-fatal, explosion in Shanghai. A former Apple executive claimed that the company has had knowledge of labour abuses in some factories for four years – “and they’re still going on because the system works for us”. Suppliers are only allowed the smallest margins on what they produce for Apple, and executives at the Cupertino company always ask them for details on part costs, worker numbers and salary sizes. But workers at a factory of Apple partner Wintek went on strike after rumours that employees were exposed to toxins because they evaporated three times faster than alcohol when rubbing screens. Apple’s late co-founder Steve Jobs, who died last October, said two years ago that the company is a worldwide leader in “understanding the working conditions in our supply chain”. Steve Jobs said many of the factories have restaurants, cinemas, hospitals and swimming pools. While staff says they appreciate these facilities, the working conditions are still seen as relentless. Foxconn said conditions are “anything but harsh”, just one in 20 workers assembly line workers must stand to do their jobs and the firm has a “very good safety record”, reported the New York Times. 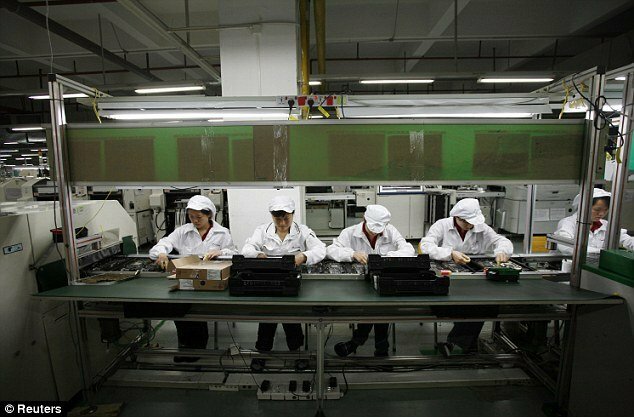 The Mail on Sunday visited a Foxconn factory making iPods in Shenzhen, China, in 2006, and its reports on long hours, crowded accommodation and punishments shocked Apple executives. “We’re trying really hard to make things better,” one former Apple executive told the New York Times.